I love travelling as much as I do food, but for some reason, I have never been on a cruise before. Fears of being trapped on a vessel and being horribly bored perhaps? 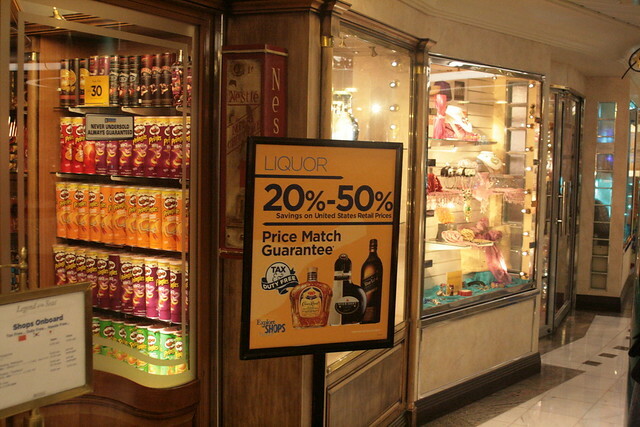 But then again, I have never explored what a cruise ship is like. 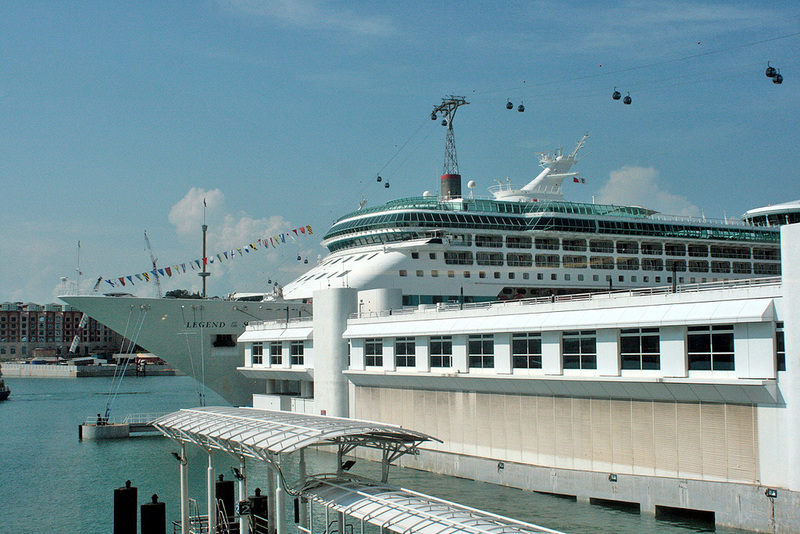 Until the day OMY.sg brought 40 bloggers on board Royal Caribbean's "Legend of the Seas" for a ship tour. I must say it's got my curiosity piqued. Royal Caribbean made it to Oprah's Ultimate Favourite Things 2010 (but note that's for the world's largest cruise ship "Allure of the Seas"). They've won several awards for being the best cruise operators (especially for luxury and family cruises). 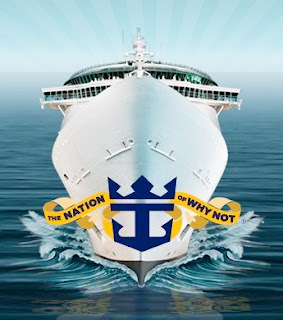 They also call themselves the Nation of Why Not. With 21 stateships, 251 ports of call and millions of square kilometer sea terrain, they deem themselves practically an independent country. And with "why not?" as a motto, they strive to make all things possible. Rock-climbing at sea? Ice-skating under the summer sun? Why not! The ship is also a lot larger than I expected. It can take 2,074 passengers and has a crew of 750! That's a lot of staff. This is probably where most people will throng. The sundeck. 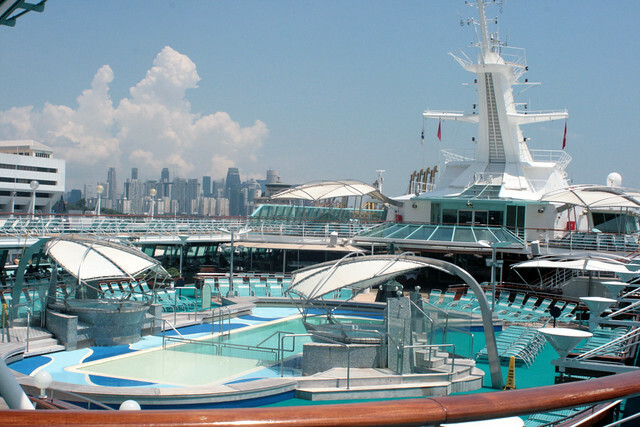 There are indoor and outdoor swimming pools, solarium and whirlpools. 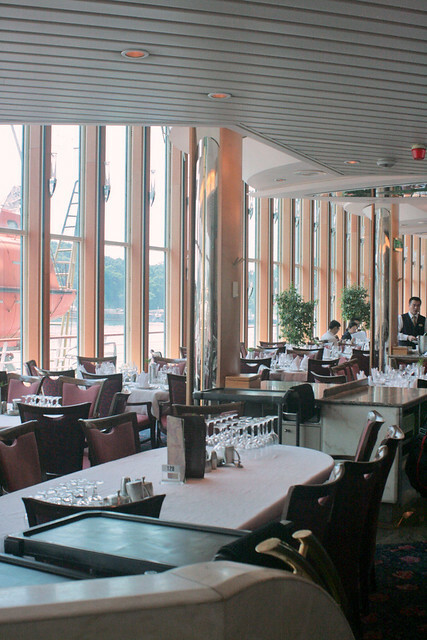 The ship is like a floating hotel. 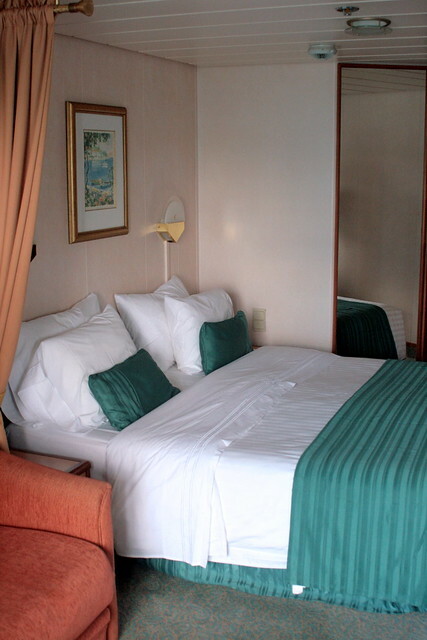 There are four kinds of staterooms - Interior, Oceanview, Balcony and Suites You can check out 360-degree views on the website. The first sight of a balcony made us quite excited. 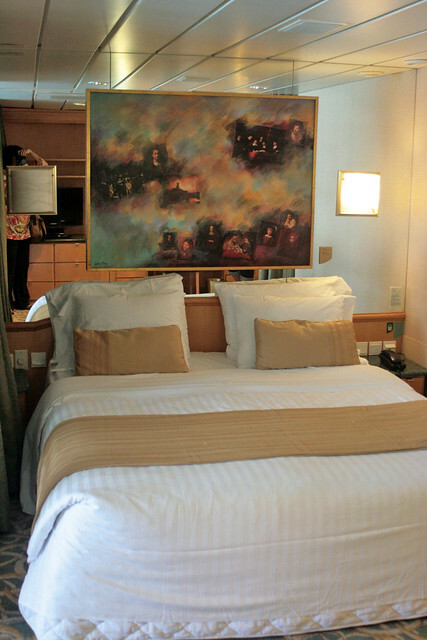 The lower level rooms are small but cosy. The rooms got more and more posh as we went higher. The final stop - the Royal Suite - even has a baby grand piano! That's not all, it's got a walk-in closet, Roman-style bath and separate toilet/dressing area. There's a cluster of shopping boutiques, a day spa, a fitness centre, a medical centre, a video arcade and teen disco, a photo gallery where you can order prints or CDs (they even sell digital cameras there). Everything is transacted in USD. 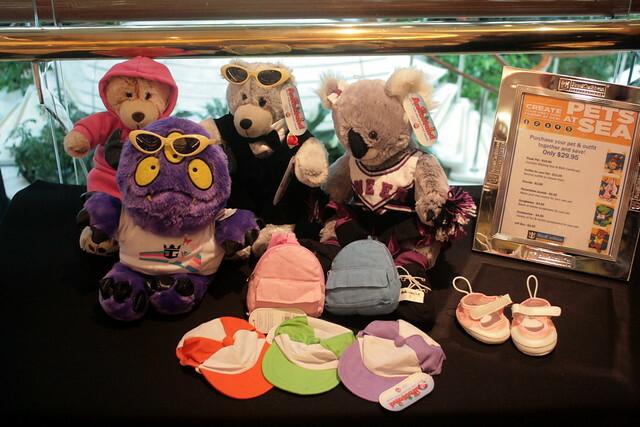 They also have special programmes tailored for children and youth (different age groups from 6 months to 17 years). There's even a special machine there that lets you stuff your own soft toys! 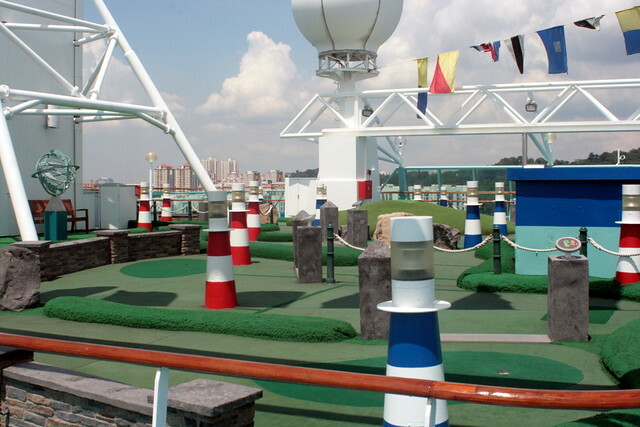 A 9-hole miniature golf course will keep golfers happy. Thrill-seekers can scale the rock-climbing wall right behind it. 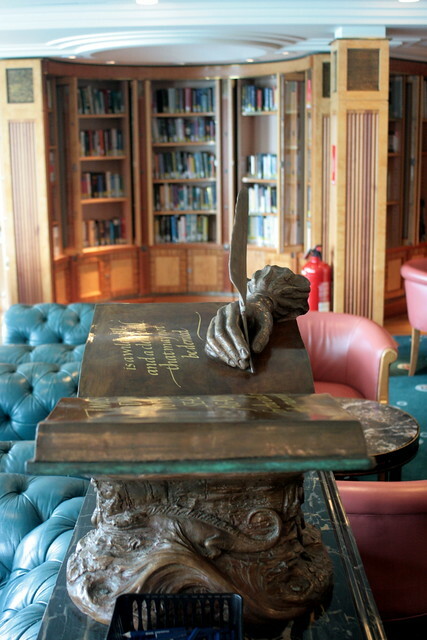 If you prefer some peace and quiet, there is a library on the ship, and opposite that, a card room where you can play board games or rent mahjong. If you want live entertainment, there's music and comedy shows, as well as Broadway-style musicals. But I reckon most folks will be hitting the casino. My group didn't get a chance to view the casino or take photos of it (not supposed to, anyway), but I'm sure you'll see it on other blogs. 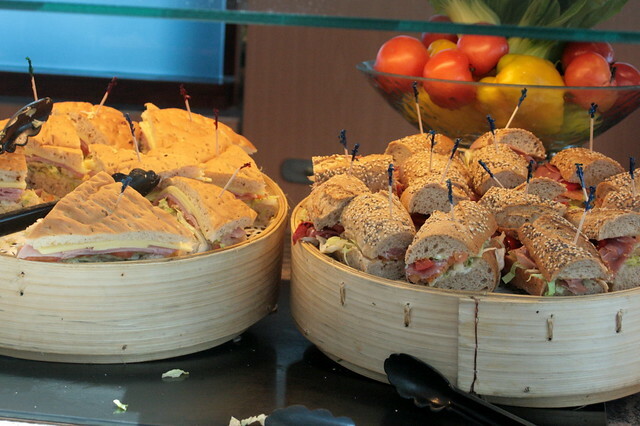 Food on a cruise is important. 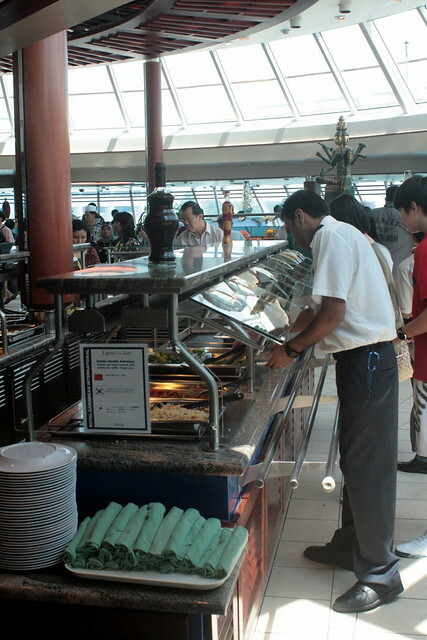 There's plenty of food at the Windjammer Cafe, a buffet/casual dining restaurant. You have all kinds of cuisines, from Asian to Western. The food is constantly replenished. You can dine around the pool area or indoors. Alternatively, you can escape the buffet battlezone and enjoy a spot of fine-dining at the two-tier Romeo and Juliet dining room. Elsewhere, a small pizza parlour and Ben & Jerry ice cream bar serves not only edible treats but wi-fi as well. And if you are lazy, there's complimentary 24-hour room service. Our tour ended with a lunch here. But as some of us realised later, some folks got more out of the tour than others. A particular blogger group had a little bit more excitement while touring the solarium as one of the bloggers ditched her dress and showed off her bikini. 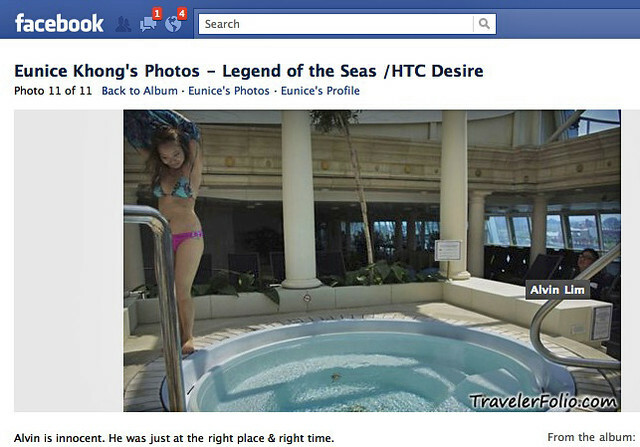 Cameras went crazy, and photos started appearing on Facebook (this one courtesy of Eunice of Travelerfolio.com). 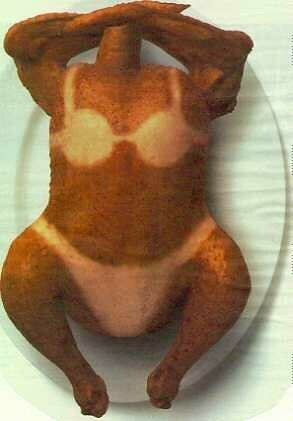 Well, well, guys, so now you know what the sun and a pool can do to women captive on a cruise ship. You'll certainly find a lot of tanned chicks here. Thanks, OMY.SG and Royal Caribbean for the insightful tour and lunch. I'll say this experience has made me curious about cruises. If you are interested, prices start from SGD279 per person for a 3-night cruise. Look out also for special rates advertised in the Straits Times and Today. If you'd like to see more of the Legend of the Seas, you can view my Flickr set of 70 photos (I am sorry I cannot fit all of them on this blog post). I am also going to upload on Facebook and tag, tag, tag, tag! 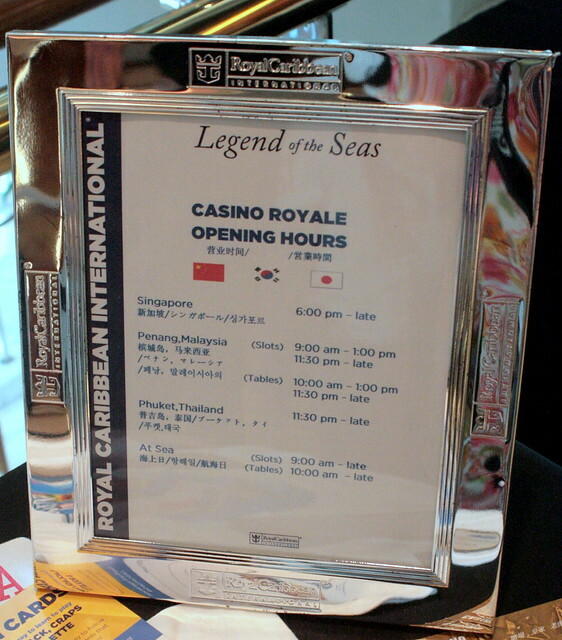 Oh check out also omy.sg's coverage on our Royal Caribbean Legend of the Seas tour. Let me know too, what your cruise experiences have been like! Awesome captures.Thanks for sharing this knowledge about "Legend of the Seas".I also have desire to travel in a Cruise.I will surely fulfill my wish during my travel to Caribbean next year. Nice pictures, now you made me want go for a cruise! Didn't know what I was in for when my wife asked me to join her and her ex-colleagues for the Best of Malaysia cruise, with stops at Penang and Port Klang, from 3-6 Dec. Having been on Star Cruise, your coverage on Caribbean sounds pretty exciting. You have saved me some web surfing time. Thank you. Hiya Edmund! You got nice photos too! Quay Po: I also want to go! 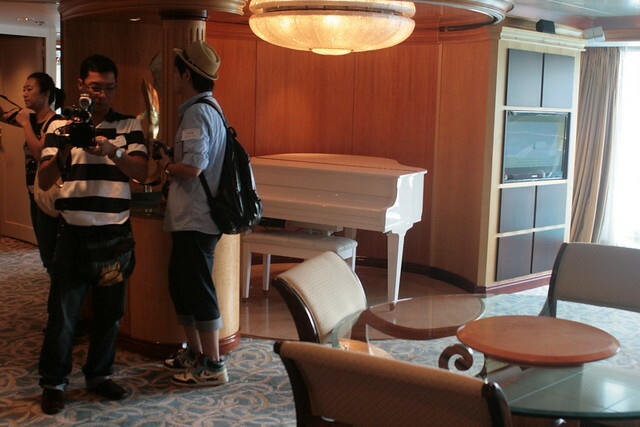 Soundman: Wow, you are going on this cruise ship? Lucky you! :D Well, I'm glad my photos came in useful! 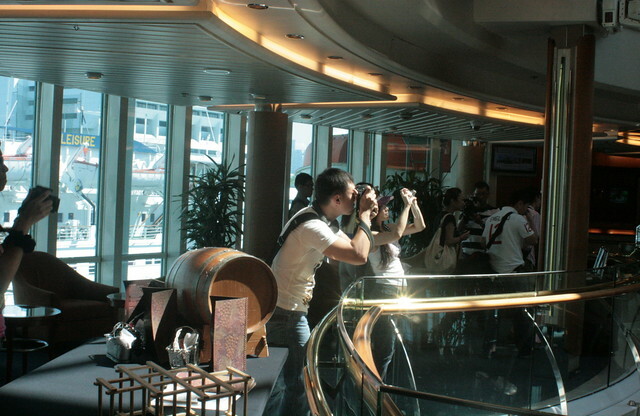 Cruise ship adventures are great but I don't really think its for everyone. Most people would be bored (to death) being trapped on a vessel for such a long time. But...if you enjoy the fresh air and open seas (like I do) I'm sure you wouldn't mind. As a matter of fact, I think most people can use some fresh air anyways. You are stronger than any situation. You are stronger than any doubt. You are stronger than everyone else thinks you are, stronger than you were yesterday. You can do whatever it is you want, whatever you decide you are going to do. Now, what are you waiting for?